Calgary, Alta. 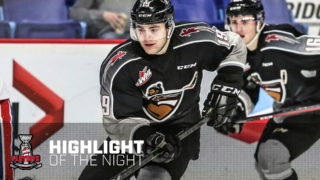 – The Western Hockey League announced today that 2019 NHL Draft prospect and Vancouver Giants defenceman Bowen Byram has been named the WHL On the Run Player of the Week for the week ending January 13, 2019. 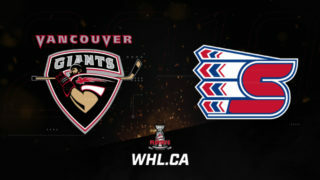 Byram recorded six points (3G-3A) and a plus-six rating in a pair of games this weekend as the Giants extended their winning streak to three games, helping them maintain a nine-point lead atop the B.C. Division standings. 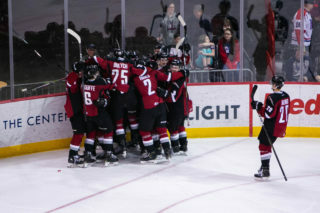 Saturday, Byram set a franchise record for points in a game by a Giants’ defenceman, scoring twice and adding three assists for the first five-point game of his WHL career in a 7-4 win over the Kamloops Blazers. Byram scored the first two goals of the game while picking up assists on the team’s fourth, sixth, and seventh goals. All of Byram’s points came at even strength as the Giants scored just one power-play goal in the contest. The five-point night for Byram set a new career high for Byram, who had previously recorded three points on three separate occasions. Sunday, Byram picked up another even-strength goal in the first period of a 3-2 win against the Victoria Royals. 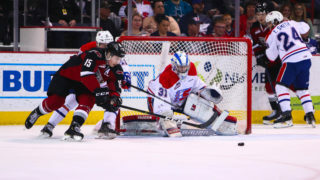 Originally selected third overall, at the 2016 WHL Bantam Draft by the Giants, Byram has impressed in his second full season in the WHL, posting 39 points (13G-26A), including four power-play goals, one short-handed goal, and two game-winning goals. Overall, the Cranbrook, B.C. product has appeared in 111 WHL regular season games, posting 66 points (19G-47A), including seven power-play goals, one short-handed goal, and four game-winning goals. 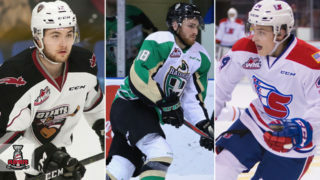 NHL Central Scouting has ranked the 6-foot-1, 192-pound defencemen as an ‘A’-rated prospect ahead of the 2019 NHL Draft in their ‘Players to Watch’ List. Early on in his hockey career, Byram has worn several jerseys. This season, Byram represented Team WHL at the 2018 CIBC Canada Russia Series and has also won gold at the 2016 WHL Cup with Alberta. Internationally, Byram won a silver medal with Canada Red at the 2017 World Under-17 Hockey Challenge and was part of Canada’s roster that won gold at the 2018 Hlinka Gretzky Cup last August. The Giants return to action Wednesday, January 16 (7:05 p.m. PT), travelling south of the border to face the Tri-City Americans.